Huckleberry Kush Sugar Leaf Tip. Photo by Professor P of Dynasty Genetics. Knowing when to pick a ripe bud is as much art as science. Each grower has their own processes and criteria for determining ripeness; but there are a number of things a savvy grower will watch for. Most growers induce their plants to flower using twelve hours of uninterrupted darkness. However, plants can be forced to flower at a shorter period of darkness. Look for the first signs of flowering and then count back one week from that period. Look online for dusk and dawn hours in your region. Count the number of hours between dusk and dawn; that is the number of hours it takes to force flowering. Once a plant is forced to flower, it takes between seven and nine weeks for it to ripen. Let’s go through some of the stages of ripening during this period. During the first week of flowering you’ll see the beginning of stigmas. Stigmas are white hairs that protrude from the newly forming pistils. They’re hollow inside and have brushes on the outside through which they filter the air containing pollen. When they capture the proper grain of pollen, they strip the sperm from the pollen and send it down the hollow tube to meet the egg. If the stigmas are un-pollinated they remain white for a long time. By week four the plants are in full flower and they put out layer after layer of stigmas so the bud gets thicker and thicker and eventually, quite hard. By week six the buds start to ripen and the stigmas start turning brown. When growing outdoors, the days get shorter and the nights become longer. 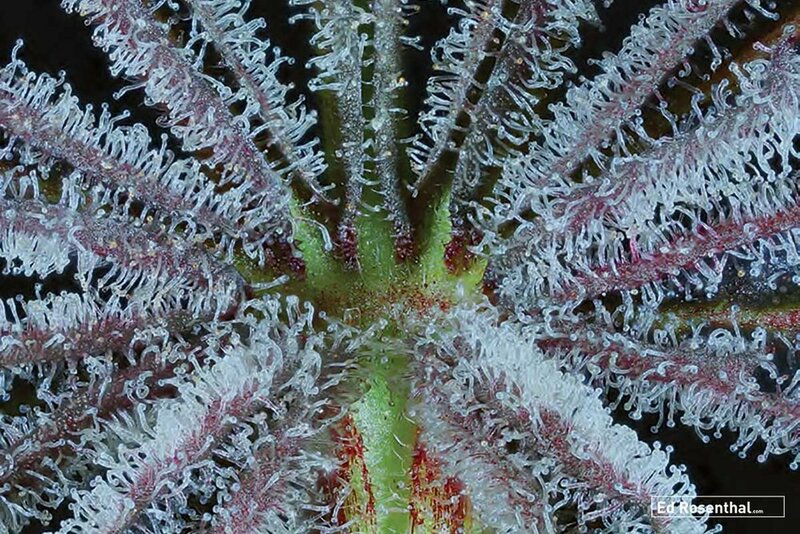 The trichomes, the glands on the leaves surrounding the flower that hold the THC and other cannabinoids and terpenes, start becoming more prominent; eventually the caps on these glands start filling up. By week 7 or 8 we’re about a week away from ripening. Most of the stigmas are brown and the trichomes are more prominent. The glands continue to fill up with THC and terpenes; they look like mushroom caps. They begin tobulge like balloons. The odor becomes more intense; but the bud is still not ripe. It still hasn’t reached peak intensity. This is a ripe bud. You can see that the trichomes are totally erect and the caps on them are prominent. They’re bulging with resin, the stigmas are brown and in this case a fake seed pod is visible. This isn’t unusual. Fake seed pods can develop with some varieties. Now let’s look at it close up. These are all mature flowers. You can see the caps are bulging, but at this stage you see that almost all the glands are clear but a few are beginning to change color, either to an amber color or to a milky white. That’s an indication that they’re changing from potent THC to much less potent CBN. It’s at this point that the plants should be picked. This period lasts about 72 hours, depending on the variety. The trichomes are filled but the caps are not bulging. They are all clear and the odor is beginning to increase. In the last week the intensity of the odor will quadruple. When completely filled the caps will look like balloons ready to burst. In the last week the intensity of the odor will quadrouple. When completely filled the caps will look like balloons ready to burst. The trichome caps are bulging. The vast majority remain clear but a few have changed color to white or amber, indicating a change of THC to CBN, a less psychoactive cannabinoid. The odor has increased and reached peak intensity. As the buds grow stale the odor becomes less pleasant —smell somewhat akin to fermentation. The glands turn color indicating change of THC to less potent cannabinoids, and the gland heads start falling off the stalks. Because blooming plants need more nutrients (particularly phosphorus and potassium) to stimulate growth and flowering, growers often administer products such as bloom enhancers or stimulators. If using molasses or another sugar in the water/nutrient mix, continue using it throughout ripening, even when flushing. One formula is 1 tsp/gallon (5 ml/4 L) or a tbsp/5 gallons (14 ml/19 L) of water. Each of the products that were listed has an effect on the taste and the form of the buds. Unfortunately, there have not been side-by-side controlled tests so you have to rely on you own experience and those of others who have shared theirs’ in garden forums. Do you want to save time, labor and learn how to avoid the heartache of a great crop destroyed post-harvest? THIS BOOK WILL CHANGE THE WAY YOU HARVEST NEW TIME SAVING TECHNIQUES SHRINK CUTTING AND PROCESSING TIME BY 50% OR MORE!